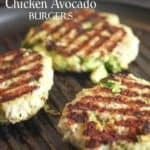 Chicken Avocado Burgers ! 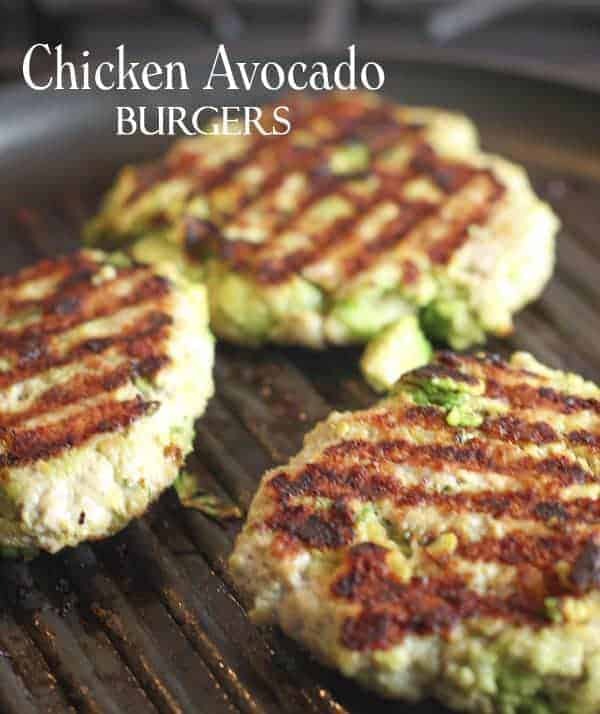 Ground chicken with fresh chunks of avocado mixed right into the burger before grilling! This is really a one of a kind burger! The avocado is mixed right into the ground chicken and becomes all warm and soft…it’s a burger bomb that’s super healthy and delicious! Why we love these Chicken Avocado Burgers! super easy to make with simple ingredients, just the way we love it around here! the avocado gets all warm and soft when cooked inside the burger and lifts it to a whole new level of flavor. Who doesn’t love avocado! Paleo and Whole30 – this burger is a clean eating machine! This has turned out to be the most viewed post on our blog…to say I didn’t see that coming is an understatement. The reason for it’s popularity is because it is so Paleo and Whole30 friendly, not to mention super easy. To learn more about the Whole30 program, click here! I love this book! I could never have done the Whole30 without it! Make a double batch, you will be glad you did! Hellooo lunchbox! How to make Chicken Avocado Burgers! I usually cook these on a grill pan indoors, it helps keep the meat moist…but you can certainly grill these outdoors. Just be careful not to overcook. I love this Grill Pan! Nutrition info is based on Panko crumbs. Can I use ground turkey in place the ground chicken? Yes, and a lot of comments say it’s great! But ground all breast meat is dry. It is. Can’t change it. The avocado helps but fat free turkey tastes like fat free turkey. We recommend a blend of 93/7 ground turkey if you can’t find ground chicken. A few other fast, fresh and fabulous meals for you to try that are Paleo and Whole30 Compliant! Easy Roasted Chicken with Lemon and Rosemary! – switch out the red potatoes for sweet potatoes to kick it up! 30 Minute Chicken Puttanesca! – One pan and tons of flavor! This comes together quickly and if your not an olive fan, no worries, just leave them out! All our favorite Whole30 and Paleo recipes in one place! GET THE FULL RECIPE VIA VIDEO HERE! A new twist on a Chicken Avocado Burger! Mix cubed avocado directly into your ground chicken for a super kicked up avocado flavor! Shape into desired size patties . Grill 4-5 minutes on each side on an indoor grill pan or an outside grill at medium heat or until the internal temperature reaches 165 degrees. For best results buy avocado more on the firm side. This will ensure the chunks stay intact during mixing and cooking. We like a ground chicken that is 97/3. A little bit of fat makes these much tastier. Ground chicken breast can be dry. Grill indoors or out. 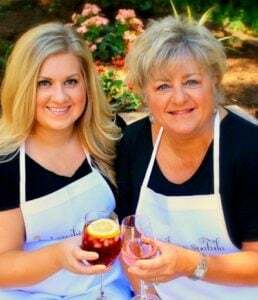 We love to use our indoor grill pan for this! 6 Easy and Fresh Sheet Pan Dinners! How long do these last after cooking? Can I refrigerate them and keep for a day or two? I have kept a day or two in the fridge (because I am a ‘left over for lunch’ junkie). Shouldn’t be a problem. I think the chicken will last longer than the Avocado. Thanks! Theses sound tempting. Are the flavorful? Seems like they would need some spices. I recently made them and added a chopped up Anaheim pepper and wow! Don’t even need to sauté the pepper…just toss it in with the Avocado – it really kicked up the flavor another notch! These are delish! Does anyone know the nutritional info on them? What size of a patty are we talking about here with that nutritional info? Those numbers look pretty small considering you have breadcrumbs and avocado in the chicken. Just curious 🙂 Thanks! Nutrition info will depend on the number/size patties you make, obviously 🙂 This is the info for making 5 patties from this recipe. It doesn’t include a bun or toppings (which is where a lot of calories would come from!). I don’t own a grill but I would love to make these. How would you bake them or cook them in a skillet? I baked them for 30 minutes at 350, they turned out better than my pan fried ones. I am going to try that! I hate stove top frying, messes up my clean stove 🙂 Starting my Whole30 on Monday, will bake a batch…great idea! I cook mine in the skillet with jalapeño infused olive oil . Just enough spice And if you cook it long enough it will brown. Delish. I made them on my skillet at home and the turned out perfect! Yummy! Do you think you could freeze them? Avacados do not like to be frozen. I tried it once and never again. It makes a very unpleasant tasting mess. So you freeze them cooked, yes? Cooked is what I do but you can certainly freeze them uncooked, thaw and cook. I’ve frozen my patties raw. To address another poster, I have also frozen many an avocado. It is very hard to keep fresh and ripe avocados on hand. They either aren’t ripe yet or they go bad before I can eat them all. So, I read an article on freezing them which works fine for me. I first mush up the avocado in a bowl. Divide up how much of a portion you want, for me I use about 1/4 cup. I put these individual portions in silicone muffin cups and freeze. Once they are frozen, I simply pop them out of the muffin cup and put them in a baggie. So now I have a large ziploc freezer bag with avocado “disks”. When I want avocado my first choice is fresh, but if I don’t have one that is ripe, I can simply defrost one of my avo disks. Yes, it does get dark, but who cares what color it is, I don’t. The taste is the same, but yes, the texture does change. It’s fine for me though, especially if you are mixing it in a burger, or mixing it with a veggie/potato/rice, or in a smoothie. If you want a slice or chunk of avocado, no, the freezing method won’t work, obviously. I’ve had great luck freezing these, somehow! Keep all the packaging your ground chicken comes in. If freezing them with raw chicken, I recovered them with that, plus saran wrap. If cooked, I wrapped them individually in tinfoil. Just find an effective way to keep the air out. These are delicious with ranch powder mixed in, too!! Looks great! Do you have to use the breadcrumbs, or can you omit them? GREAT IDEA!!! 🙂 Can’t wait to try this recipe! That is a great idea! I’ll add that note in the recipe! Thank you! Publix actually sells gluten free bread crumbs and have worked great with anything I cooked that required them. I used ground flaxseed meal instead of the crumbs but I havent made them yet so the verdict is out. Will update. I was thinking about using grated Parmesan cheese instead of the bread crumbs to make it low carb. Parm would be tasty! You could use cooked Quinoa as well. I use it in Meatloaf and it works great as a binder. Just make sure it’s a bit on the dry side and not mushy. Good Luck! A little bit of almond flour could make it low carb as well. That’s what I plan on using since my fiance & I are doing Keto. That could work…it’s hard to go wrong with these….let me know how they turn out! Where do you find ground chicken? I’m not sure where you are located but I get mine at QFC which is Kroger or Fred Meyer. Iserio brand ground chicken. Foster makes one as well but I have not tried it. If you are forced to use ground turkey all is not lost! Just try to stay away from the Foster stuff, its mushy. Good Luck! ALDI sells ground chicken as well. All you paranoid, paleo, health nuts worried about additives and preservatives, try this: GRIND YOUR OWN!! Seriously though, I try to eat as cleanly as possible and the only way to ensure that your ground meats are additive free is to do it yourself. True, but only if your chicken breast is additive / hormone-free or preservative-free to begin with. That sounds wonderful! Happy eating! How would you dress out this burger on a bun? Hi Rick – isn’t that funny, I’ve only eatin’ them bunless! I’d just go for a fresh bun and mayo myself, these pack a big flavor on thier own! I think some nice fresh crispy lettuce and a slice of tomato would taste great. I think salsa and fresh cilantro. Also, a chutney would be a nice change. Flatbread or no bun for low carb. Flatbread isn’t low carb. Better to wrap in lettuce if you go low carb. There are already bread crumbs in the recipe so those would have to be replaced to really go low. I think I’d leave them in and use lettuce. Low carb is fine. No carb is overdoing it. I don’t see bread crumbs in the recipe. Am I missing something? Hi Mitzi. From my post : This has turned out to be the most viewed post on my blog…to say I didn’t see that coming is an understatement. The reason for it’s popularity is because it is so Paleo friendly. The original recipe I posted included bread crumbs. I tested the recipe without the bread crumbs and could find no noticeable difference so I removed that ingredient to make it truly Paleo and Whole30 compliant. I am assuming you are mentioning that because of the recipes Whole30 compliant status. If you notice, there are Whole30 and Paleo substitutions for a binder. My favorite is almond flour. @Cyndiann I think she was saying flatbread or for no carb no bun. Lol!! Yummy!!!!!!!! These look super tasty!! Can’t wait to try them!!! I tried it with black bean hummus, onions, and flatbread. Delicious!! I would imagine if you asked the butcher at the store they would be more than happy to grind up a pack of chicken breasts for you.